Mezzanine ground floor: living-room with dining area and sofa-bed, small kitchen, double bedroom (air conditioning) with ensuite bathroom with shower, twin-bedded room (air conditioning) with ensuite bathroom with shower. In July, 2017, my family, Grandchildren, and some friends reserved several rooms at the Castillo de Montegufoni, and what an exceptional and magical vacation we experienced for 7 days. We initially wanted to reserve some apartments somewhere in Italy for a family holiday, when we came upon this website, while searching for a unique Italian vacation. 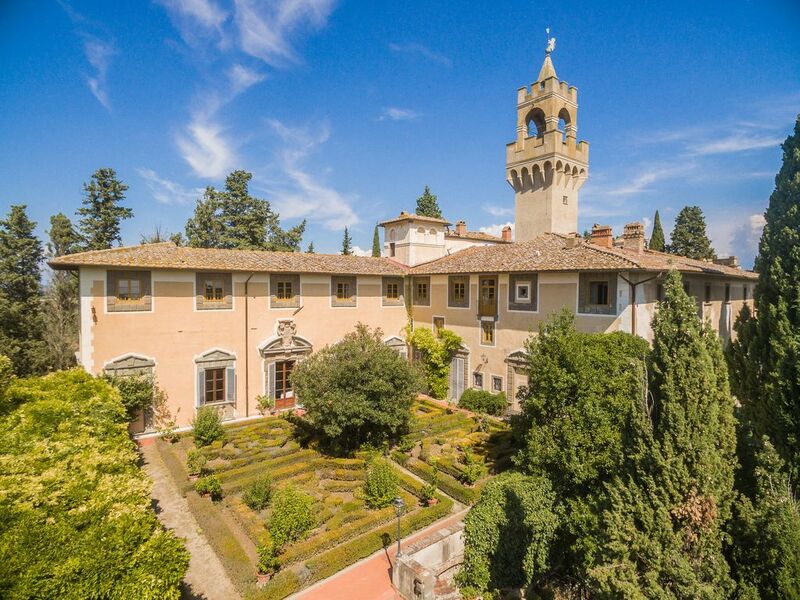 After researching the Castillo de Montegufoni and reading all the reviews, we decided to make our reservations at this castle, which was located approximately 45 minutes west of Florence. We booked our rooms at the Castillo de Montegufoni, but within months of making our reservations, our son and his fiancé decided that they wanted to get married in this castle. We were a bit apprehensive since we thought this location would be a fun vacation venue, but sight unseen, we were concerned about it now possibly becoming a wedding destination. To make a long beautiful story, a bit shorter, this was the most picturesque, magical, and spectacular location we could have ever selected. The rooms were all uniquely different but perfect, the gardens and grounds were impeccable, the restaurant foods at the castle and in town were amazingly delicious, and the castle staff and service, especially Paula and Stefania, were so remarkably helpful, enjoyably pleasant, and constantly professional, on every single day we were there. As a summation, and as we stated in the beginning of this review, the Castillo de Montegufoni became an exceptional and magical vacation for our entire family and we witnessed one of the most beautiful weddings ever! Our entire family, including our Grandchildren have vowed to return to this magnificent castle in the very NEAR future! The place is wonderful. Our apartment was very nice, the grounds are breathtaking and so peaceful. Really enjoyed our stay there. Met some wonderful people and the staff were all very helpful . Thank you . Sehr schöne Wohnetage. Perfekt zum Entspannen. Room was comfortable and lots of space. Staff was very friendly and helpful. Food in the restaurant was great. Appartement is zeer geschikt voor 4/5 personen. Twee ruime slaapkamers met eigen badgelegenheid. De huiskamer is vrij karig ingericht maar beschikt over een goed bed voor een 5e persoon. Kleine keuken, je kunt er echter wel een maaltijd in bereiden. Geen wasmachine, koffiezetapparaat,vaatwasser. Nadeel van dit appartement was het terras. Dit was erg klein en feitelijk niet bruikbaar. Wij hebben daarom gebruik gemaakt van het tegenover gelegen tuingedeelte, hetgeen een redelijk alternatief was. De terrassen bieden bij de appartementen in dit gebouw geen privacy en liggen dicht op elkaar. Er is een klein zwembad bij het kasteel met ligstoelen er omheen en een mooie aangrenzende tuin met voldoende schaduw waar je heerlijk kunt zitten. Goede uitvalsbasis voor Florence, Pisa, Siena, Volterra, Luca. Restaurant van het hotel heeft een zeer beperkte kaart. Er zijn echter genoeg geschikte alternatieven in de buurt. [English translation courtesy of Easy Reserve] Apartment is suitable for 4/5 persons. Two spacious bedrooms with private bathrooms. The living room has pretty sparse furnishings but has a good bed for a 5th person. Small kitchen, you can prepare a meal however. No washing machine, coffee maker, dishwasher. The disadvantage of this apartment was the terrace. This was very small and not actually usable. We have therefore used the opposite garden area, which was a reasonable alternative. The terraces of the apartments in this building offer no privacy and are close to each other. There is a small pool at the castle with sun loungers around it and a nice adjoining garden with plenty of shade where you can sit. Good base for Florence, Pisa, Siena, Volterra, Lucca. The restaurant on the property had a very small menu choice. However, there are plenty of suitable alternatives nearby.